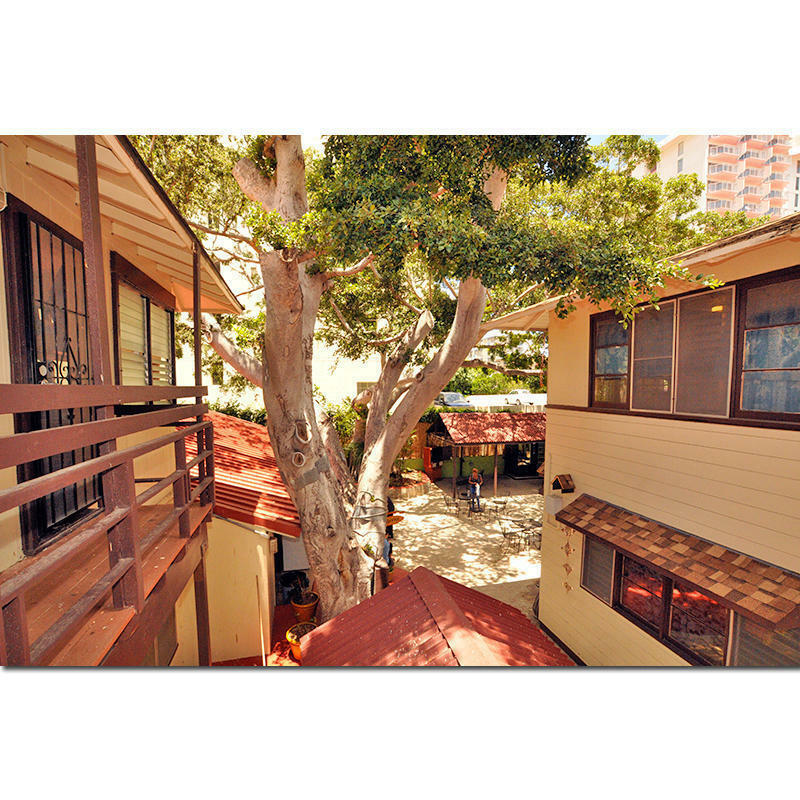 Enjoy a traditional hostelling experience at the only family run hostel in Waikiki. 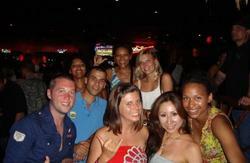 We are in the middle of Waikiki minutes away from beaches, restaurants, shopping and clubs. Our Banyan Courtyard is very popular with our guests and promotes a unique and friendly atmosphere. Whether sharing cooking duties for a meal in our central kitchen, having a pleasant conversation with new found friends in our comfortable Banyan Courtyard, or Skyping with loved ones and family back home we can be your base of exploration while in Hawaii. 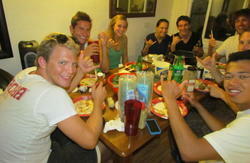 We are one of the smallest, and only, family owned and run hostels in Waikiki. We like to party, but party doesn't get in the way of adventure. We strive to create an environment where you can be among friends, both old and new, yet still get enough sleep to charge ahead tomorrow. We are situated on Seaside Avenue which is at the geographic center of Waikik between Kuhio Avenue which is the main bus route and Ala Wai Boulevard which runs alongside the Ala Wai canal. 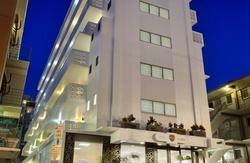 We are a 3 block walk to the beach with the main bus route and direct airport shuttle service almost at our doorstep. There are more than 4 clubs and 10 pubs within a 5 minute walk or less. We have eight dorm rooms with from four to six beds and between. Female and 4-bed dorms have privacy curtains. All except our lowest cost dorms have a lockable storage locker for each guest. Parking available by pre-arrangement. Restrictions Apply. Email us for specifics. Reception 8:00 to 24:00 Monday to Sunday, during slow season reception may be closed from 12 noon to 4 pm. Please note if your arrival is different from reception hours or you are changing your arrival time, you should email us or call us directly to confirm your check-in time, airline, and flight number. If you are coming from Australia or the Pacific please remember we are a day behind you since you will be crossing the International Dateline to get here. Cancellations are only accepted by email at least 48 Hours in advance of your check-in time. Late cancellations are automatically charged for the first night. The Seaside is a tourist only hostel so a passport or other form of photo ID, credit or debit card and a boarding pass must be presented at check-in. We have a 2 (consecutive) day minimum stay policy. You can book a shuttle for about $9 dollars per person, or $15 round trip (recommended) tell them you're going to the Hawaiian Seaside Hostel on Seaside Ave. Estimated travel time is 30 to 60 minutes. Take 19 or 20 to Waikiki. Exit at Seaside Ave in front of the Starbucks at the Waikiki Trade Center / International Market place. Cross the main road (Kuhio Ave) and continue Mauka (toward the mountains) down Seaside Ave 50 meters, turn right on the driveway just pass the Motorcycle rental shop (Big Kahuna). Look for the Surfboard Hostel sign there, 419 Seaside Ave, we are at the end of the driveway. The Bus Fare is $2.25. Estimate travel time is 1 hour. Proceed to Ground Transportation. Outside you will find Taxi's for about $25-$30 dollars to get to Waikiki. Estimate time is 25 minutes. You may also find free parking nearby on Ala Wai Blvd. and there is some metered parking (free at night, Sundays and Holidays) on the local streets. There are several Parking Garages within a block or two. One at 2301 Kuhio Ave charges $10 for 1-time parking up to 24 hours (it is closed from 2am-5am).